Hi there, and welcome to my food blog. “Rarely Fancy” refers both to my cooking – I don’t have a lot of fancy gadgets – as well as myself. 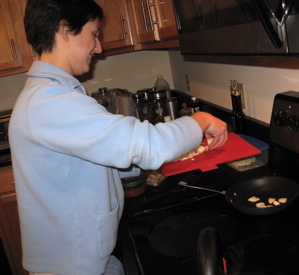 I’m generally cooking in my pajamas or sweats, as you may see in some of the photos. Right now, it’s mostly for me to remember what food I made, how I made it, and how well I liked it. And to easily share recipes with my mom, who is a great cook herself. But I do hope anyone else stumbling across this blog enjoys it. My husband says that I should have a picture of myself on here. This probably isn’t what he meant, but here’s one he snapped of me recently, cooking onions.